Diffusion Weighted Images (DWI) normally shows a low Signal to Noise Ratio (SNR) due to the presence of noise from the measurement process that complicates and biases the estimation of quantitative diffusion parameters. 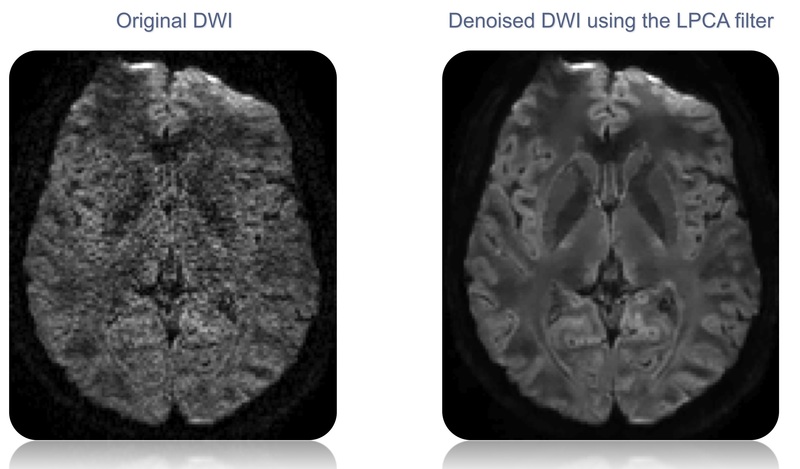 In this paper, a new denoising methodology is proposed that takes into consideration the multicomponent nature of multi-directional DWI datasets such as those employed in diffusion imaging. This new filter reduces random noise in multicomponent DWI by locally shrinking less significant Principal Components using an overcomplete approach. The proposed method is compared with state-of-the-art methods using synthetic and real clinical MR images, showing improved performance in terms of denoising quality and estimation of diffusion parameters. Manjon J.V, Coupé P., Concha L., Buades A, Collins D.L., Robles M. Diffusion Weighted Image Denoising using overcomplete Local PCA. PLoS ONE 8(9): e73021. doi:10.1371/journal.pone.0073021.2013. We have also developed a full package comparing several DWI denosing methods. You can find it here.